Here we are in Northern Chile. Ahhhh... a new country, new attitude and new altitude. After scuttling about Peru in the highlands for weeks, breathing in the paper-thin air, scorching our skin in the thin ozone of the Andes and feeling our hearts beating in our necks far too frequently, we are now at sea level and feeling more human. The 21 U$D night bus from Puno, Peru to Tacna, Peru was less than spectacular. We hung out in the terminal in Tacna and got our bearings before hopping on one of the many taxis waiting to cross over into Arica. It's a confusing system and we felt as if we didn't quite understand how it all worked, how long it would take etc. We blindly crammed 5 people, including the driver into a beat up sedan of Chileans going to Arica. The overstuffed trunk didn't shut well and we could imagine our luggage strung out along highway. Luckily when it did pop open, the driver noticed and ran outside to close it again. We got to the border and had to take everything out of the taxi and wait in a line to be stamped out of Peru. The process was effortless and after you get stamped out, another border agent sitting next to the Peruvian agent is there to stamp you in. It's the first time we ever saw two countries share and office like this. We were packed back into the taxi and headed into the barren Atacama Desert into Arica, Chile. 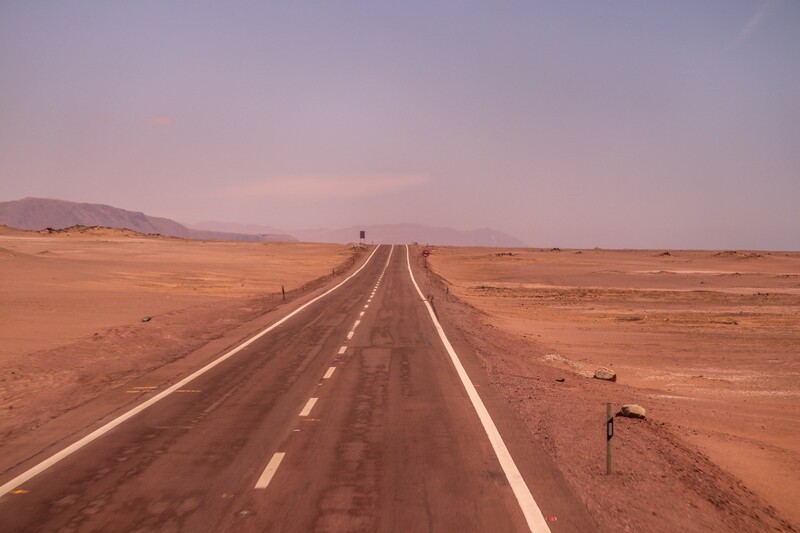 It was quite a distance from the border to Arica down a long-straight road in the brownish-red desert of Northern Chile. The taxi was only around 9 U$D for both of us and lasted about a half an hour. Arriving in Arica's bus station, we bought tickets to Iquique and had about an hour to eat something before taking our 8-9 hour bus ride to Iquique. It was a decent ride yet not much to see really, but rocks and sand. Descending down the hill from the desolate bleak landscape down to Iquique was beautiful. 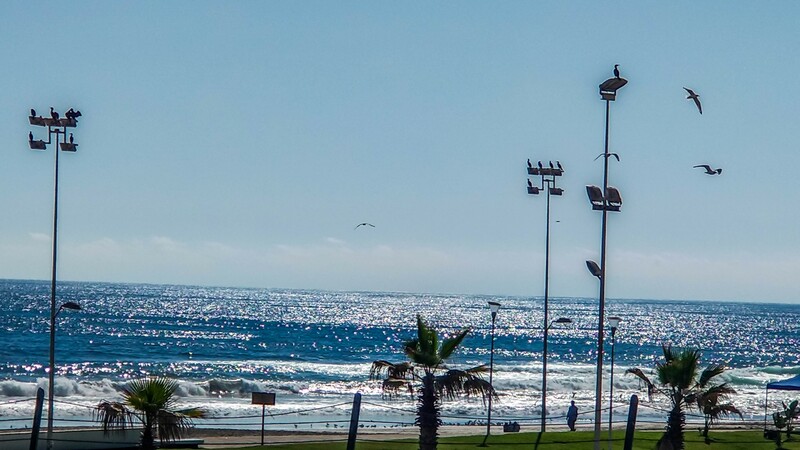 The downward-sloped highway, gave us a birds-eye view of the white buildings of Iquique, backdropped by the bluish-green waters of the Pacific Coast. 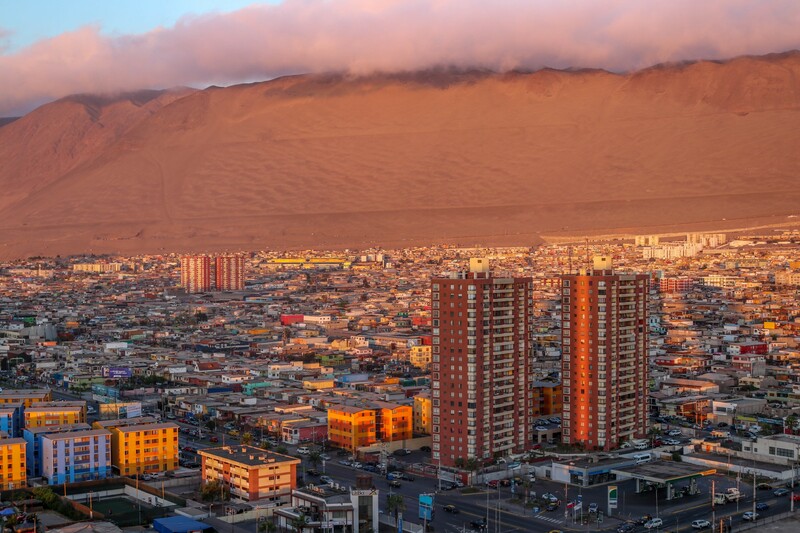 Iquique is a port town built-in the bottom of a sand bowl. 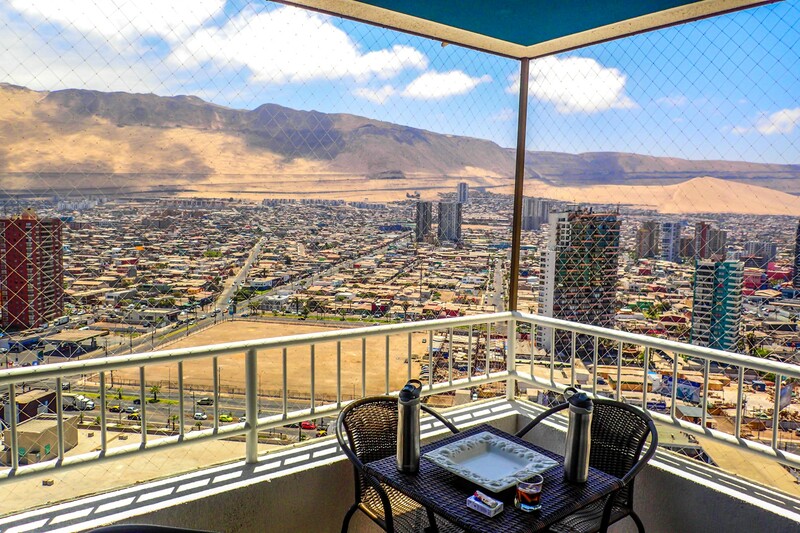 The massive sand dunes that surround Iquique, create a little slice of heaven that is the town. The dunes also provide a great place to paraglide the up drafts created by the Pacific, onto the beach below. The city of 200-300k people is known for its good beaches as well. The waters are too cold for our liking at around 18 degrees celsius, which is in the 60s fahrenheit. The town also has a good mix of big city and small town charm with its multi-block walking street, Arturo Prat square, and a boardwalk along the coastline of the city. We ended up staying in an AirBNB in a condominium building called Mar Egeo. It had towers overlooking a huge infinity pool where you could see the ocean waves and sunsets. We were on the 24th floor faced to the dunes to the east and had a wonderful 1 bedroom apartment which was nicely decorated. Our favorite part was our huge balcony where we sat most of the day. It was pure luxury, and we booked it for a couple of days and stayed a few extra after falling in love with it. It was exactly what we needed. Some comfort, a place to cook our own meals, wonderfully soft bed, incredible views everyday of paragliders launching from the dunes to land on the beach, and soaking up the sun while laying on the sand. Here is a link to the apartment. The hosts were great, but eventually we had to leave. We really could have stayed there much longer. From highlands to lowlands a lot of things change... air temperature, breathing, humidity. Going from Peru which is fairly under-developed to Chile which is modernized was a change. The Spanish of the Chileans is also different and harder to understand. The food is vastly different as well, along with the costs of things. Northern Chile is significantly more expensive than Peru. At least double the cost for just about everything. All these change can be a little unsettling and exciting at the same time. We are happy to be in Chile however, we wonder if skipping Bolivia and heading to Chile was the right decision? A few hours on the beach and hanging out in our palace on the 24th floor, helped ease those insecurities. Albeit expensive we were liking (not loving) Chile and decided to head to the Patagonia in Chile to see more of what it has to offer and see if we might love it. We love how plans change and the adventure morphs into a different experience. We suppose this is what makes traveling so exciting. The ever-changing adventure of uncertainty.